Reflexology Therapy is rooted in many cultures around the world including many Asian countries, ancient Egypt, India, etc. Practitioners such as myself believe that the body is mapped out on the feet, hands and ears. These miniature maps reflect glands, and organs. The belief is, that if you stimulate these corresponding areas you will release stored or blocked meridians or energy pathways. 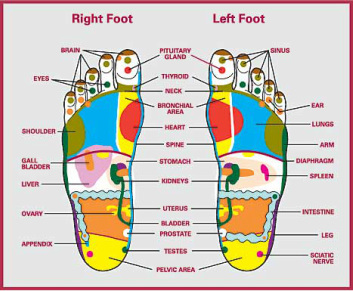 Over 7,200 nerve endings in your feet are hot spots that I believe are sites for restoring homeostasis, or balance to the body and the Spirit. I was introduced to Foot reflexology as a child through my mother who was a practitioner of the Ingham methodology in the 1970's. After the fascia is warmed by gentle stretching, twists, and smooth compression, direct pressure is applied to these zones in order to break up minute calcium deposits, and crystalline adhesions. After many years experiencing the benefits others, and myself have received. I am a firm believer in the particular art of this form of massage which dates back to 2330 BC.